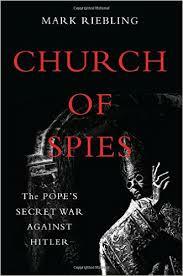 Veteran journalist and author Joseph C. Goulden offers a good review in the Washington Times of Mark Riebling's Church of Spies: The Pope's Secret War Against Hitler. One of the lingering controversies of World War II concerns the role of the Roman Catholic Church, and whether its leadership — specifically, Pope Pius XII — provided meaningful opposition to the Nazi regime. Jewish groups have been especially vocal in criticisms of Pius for his supposed “silence” about the Holocaust. And a recent memoir by German theologian Dietrich von Hildebrand offered a scathing indictment of the church for its failure to speak out more forcefully. But a different picture emerges in this remarkable book by Mark Riebling, who writes frequently on intelligence, and who gained access to Vatican files apparently not viewed by any previous author. He takes a giant stride in refurbishing the status of Pius.